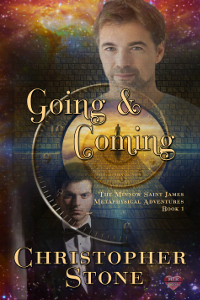 For gay, metaphysical sleuth Dr. Minnow Saint James, the workplace spans time, space, dimensions, and the entirety of the vast, incomprehensible affair that is God's Creation. At forty, Dr. Minnow Saint James, "Minn" to his friends, is a gay, metaphysical sleuth who, through Past Life Regression therapy, spans time, space, dimensions, and the entirety of God's Creation to discover the past, or future, life origins of his patient's most challenging present day problems. Minn did not always hold his current beliefs. He was born into an affluent, atheistic, Republican family in Beverly Hills, California, and raised to believe only what his five physical senses reported. In 2001, after receiving his doctorate from UCLA, Minn opened a highly successful traditional Hypnotic Regression therapy practice in Beverly Hills. For six years he enjoyed his life, until a patient spontaneously regressed herself to a past life in Eighth Century Coba, turning Minn's world upside down. Soon he was questioning his entire worldview. Now Minn is hoping that his past just might save his future.